Ralph Roberts used to be an ordinary guy—until insomnia robbed him of sleep. Now he's no longer ordinary—he can see horrible things happening to the people of Derry, Maine. He can see how, one by one, they are turning into monsters straight from hell. He'd like to call them nightmares, but he's wide awake. He can't call himself crazy, because there is another person who sees these happenings, too. But even if seeing is believing, it still doesn't give him a clue of how to stop these deadly, demonic visions from coming true. This book does a weird thing books generally don't do - it starts well but keeps getting progressively worse as the length keeps unmercifully chugging away. I was into it for the first 200 pages although little was happening and the build-up stage was generous, but it kept letting out steam as it kept going, and when it came into weird territory and everything felt muddy and more complex, I lost interest. The last few hundred pages were a chore to get through. Ralph Roberts has insomnia after the death of his wife. At first he chalks it up to grief, but as it gets worse and he doesn't get better, no thanks to the helpful remedies from mean-well folks around town, he starts worrying about his sanity. 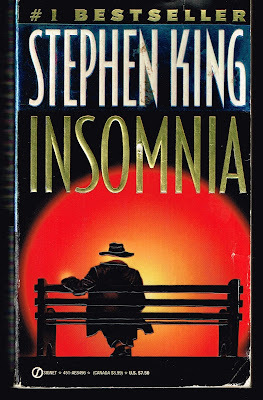 Eventually he finds out that he's not the only one, and that there's a lot more involved with this insomnia business. Meanwhile Susan Day is coming to town, making abortion activists freak out, but Ralph soon learns there's more to that business than meets the eye. Abortion is a big bag in this book. King doesn't get outright political since both views are shown with both valid points, so I don't think he intended to do a big liberal commentary on women's rights. Still, there's some spousal abuse in here, women leaning on each other for salvation, women getting rescued and strong, the mother-child bond, and personal choice/freedom. The supernatural stuff is outright weird, requiring mucho focus and suspension of belief. That wouldn't be bad, but when each scene keeps dragging on and on with the auras, the strange men, the conversations with them, then it loses its magic and shock effect quickly. It also gets major kudos for being set in the town of Derry. IT isn't mentioned, but a certain scene at the beginning of the book kind of is (the homosexual hate crime), and there is mention of when things go into the sewers, they can take awhile to show up again. The town is just bad news really, but it was nice to see Mike again in the library and hear about the Barrens. I thought it was a nifty trick that auras reminded Ralph of balloons and the strings being cut - since of course IT had balloons floating around most of the book. The characters are okay - Ralph leads the entire narration and he's not a bad character, but when he buddies up with a particular character, the plot seems to slow. Dialogue can be annoying sometimes too, especially with some of the old timer sayings. Overall there's some cool stuff here, especially if you're fans of his other books (think Cujo gets a sentence if Ir emember correctly), but the book becomes outright boring after awhile. The storyline isn't a bad idea but it doesn't have enough action sequences to support the weight of a book this long. Bummer.